Citation Information: J Clin Invest. 2015;125(12):4655-4665. https://doi.org/10.1172/JCI82267. BACKGROUND. Rabbit-generated antithymocyte globulins (ATGs), which target human T cells, are widely used as immunosuppressive agents during treatment of kidney allograft recipients. However, ATGs can induce immune complex diseases, including serum sickness disease (SSD). Rabbit and human IgGs have various antigenic differences, including expression of the sialic acid Neu5Gc and α-1-3-Gal (Gal), which are not synthesized by human beings. Moreover, anti-Neu5Gc antibodies have been shown to preexist and be elicited by immunization in human subjects. This study aimed to assess the effect of SSD on long-term kidney allograft outcome and to compare the immunization status of grafted patients presenting with SSD following ATG induction treatment. METHODS. 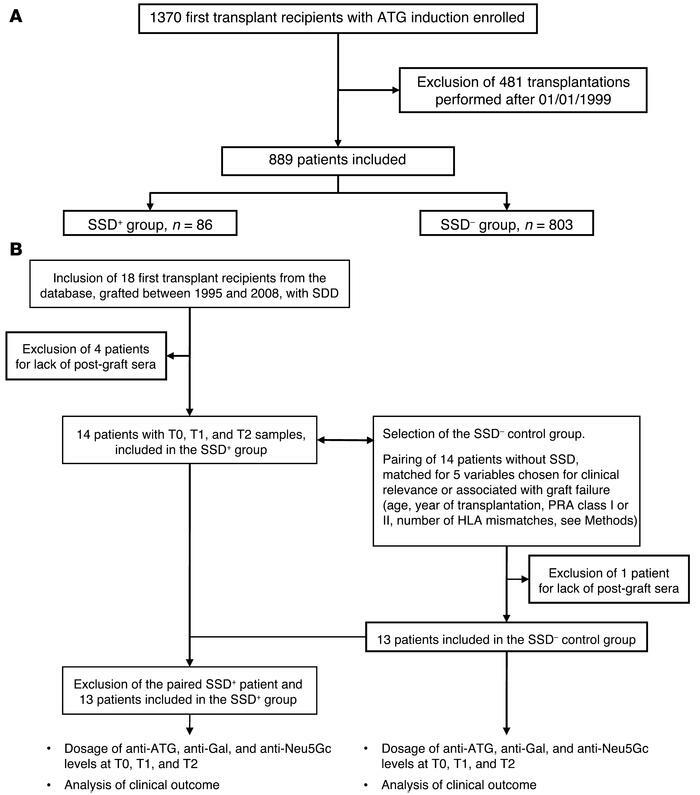 We analyzed data from a cohort of 889 first kidney graft recipients with ATG induction (86 with SSD [SSD+] and 803 without SSD [SSD–]) from the Données Informatisées et Validées en Transplantation data bank. Two subgroups of SSD+ and SSD– patients that had received ATG induction treatment were then assessed for total anti-ATG, anti-Neu5Gc, and anti-Gal antibodies using ELISA assays on sera before and after transplantation. RESULTS. SSD was significantly associated with long-term graft loss (>10 years, P = 0.02). Moreover, SSD+ patients exhibited significantly elevated titers of anti-ATG (P = 0.043) and anti-Neu5Gc (P = 0.007) IgGs in late post-graft samples compared with SSD– recipients. CONCLUSION. In conclusion, our data indicate that SSD is a major contributing factor of late graft loss following ATG induction and that anti-Neu5Gc antibodies increase over time in SSD+ patients. FUNDING. This study was funded by Société d’Accélération du Transfert de Technologies Ouest Valorisation, the European FP7 “Translink” research program, the French National Agency of Research, Labex Transplantex, the Natural Science and Engineering Research Council of Canada, and the Canadian Foundation for Innovation. Flow chart of the study cohorts. (A) Cohorts A and (B) B are shown, along with the selection of the SSD+ group and the control SSD– group matched for five clinical variables. See “Patients” for details on the selection procedure.